Chance the Rapper has pledged $10,000 from his Social Works Chicago nonprofit for every $100,000 raised for Chicago Public Schools. CHATHAM — Grammy Award winner Chance the Rapper announced Thursday nine more schools would get $10,000 from his nonprofit organization, Social Works Chicago, which has been collecting donations for Chicago Public Schools. The grants are in addition to the $1 million Chance said he would donate to Chicago's schools for arts education. "Become an active part of the solution, with your voice," Chance said on Twitter. 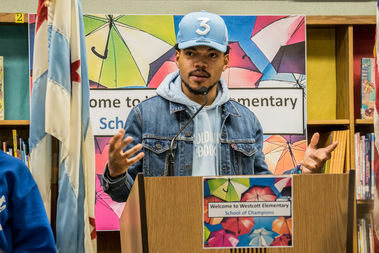 Chance also gave $10,000 to Westcott Elementary School in Chatham, the Chicago Public Schools graduate announced Monday. Chance called for wealthy Chicagoans to step up and donate to Chicago schools. For every $100,000 raised, Social Works Chicago will donate $10,000 directly to a school, he said. It was not clear how Chance — or his organization's leaders — picked the schools. The rapper, born and raised in Chatham, met with Gov. Bruce Rauner last week, when the musician and artist said he told the governor to "take our kids off the table." After working through the weekend to try to resolve the fiscal crisis engulfing CPS, Chance said he could not find a solution with the governor and told him to "do your job." Chance's efforts drew praise from former first lady Michelle Obama, who thanked Chance on Twitter. The CPS budget deficit — created when Rauner vetoed a bill that would have helped the school district pay its pension bill — threatens to force officials to end the school year on June 1 — 20 days early. Last month, CPS Chief Executive Forrest Claypool ordered four unpaid furlough days for all CPS employees to save $35 million. Earlier this month, Claypool cut $5 million by canceling professional development events for its central office staff and slashed charter school budgets by $15 million by the end of the year, officials said.